Dame Vivien Duffield, (in mid of pic) chair of the Clore Duffield foundation, talked of her “hate” at what has happened to the country in an interview with Israeli newspaper Ha’aretz, which appeared in the Hebrew language version of the paper. In 1979, Dame Vivien assumed the Chairmanship of the Clore Foundations in the UK and in Israel, after the death of her father, the British Jewish financier Charles Clore. She established her own Vivien Duffield Foundation in 1987, and the two foundations merged in 2000 to become the Clore Duffield Foundation. 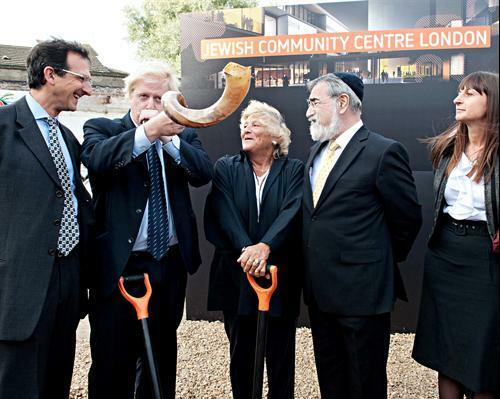 The foundation has given significant sums to British institutions, both non-Jewish – such as the Tate and the Royal Opera House – and Jewish – it was a driving force behind the establishment of the JW3 Jewish Community Centre. Over the decades Dame Vivien’s foundations have also donated extremely large sums – as she told Ha’aretz, “a few hundred million pounds at least” – to Israeli charities and infrastructure projects, including the Weizmann Institute and the Tower of David Museum in Jerusalem, as well as a number of Beit Hachayalim (free hostels for soldiers), libraries, parks and women’s shelters. “Every step Mr. Netanyahu takes is a catastrophe, and it is very difficult to defend Israel right now, to represent it in England,” Dame Vivien said. “In 1967, a week after the war, my father and I flew over Israel, we came to the West Bank and saw the Arabs who lived there. “I was naïve. I told my father the best thing we could do was to build a swimming pool and sports hall in every village and town. I think it could have been much better than what happened in the end – today the situation is getting worse, more and more settlements are being built. She also said she would be more “choosy” over the distribution of funds within Israel in future. “Our foundation contributes to the science, education, health and well-being of Arab society in Israel, for the diversity and different population that lives in Israel, and we are the first to support projects for the Arab and Bedouin community,” she said. This entry was posted in News and politics and tagged Clore Duffield foundation, Israel is Apartheid nation, My Israel Is dead, Netanyahu is a catastrophe. Bookmark the permalink.